Whether you want to build a new home or renovate the kitchen in your existing home, 2016 is an exciting time to be planning for a new kitchen. There are so many fun, attractive, and practical trends surfacing in kitchen design this year! Any kitchen designed with these elements in mind is sure to make you happy for years to come. Here are the top kitchen design trends for 2016. Simply put, transitional design is a style that blends old and new, traditional and modern. Transitional kitchens became more popular in 2015, and will be sure to continue on the upward swing throughout 2016. This is the perfect kitchen design for anyone with an older house, or someone who likes to decorate with traditionally-styled furniture or themes. You get the classic lines and designs without sacrificing modern conveniences. Shaker style kitchens: Known for their clean lines and uncluttered design, Shaker kitchens perfectly capture an overall simplicity that jives well with both traditional and modern design. Farmhouse kitchens: The large, open space and rustic feel of a farmhouse kitchen is coming back, but now it’s combined with modern appliances and lighting, like the kitchen pictured above. 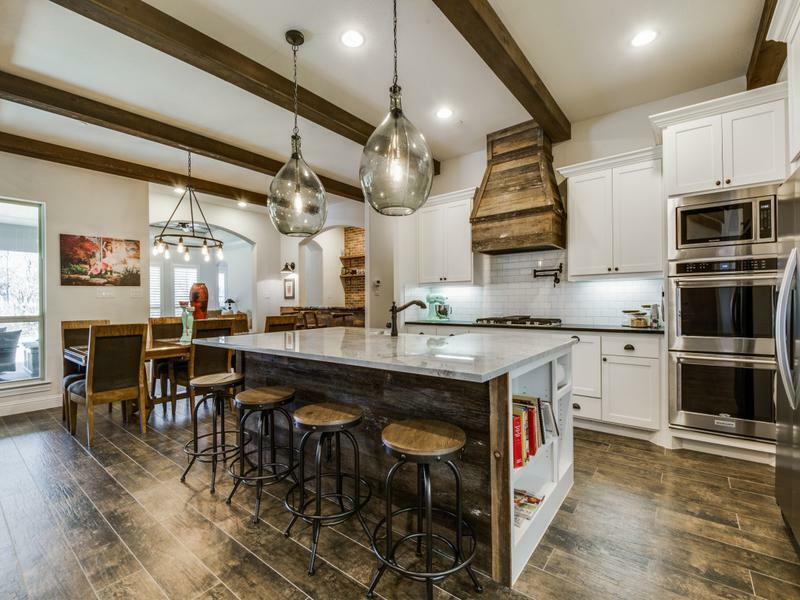 The increasing popularity of this kitchen design has coincided with the rise in traditional elements such as big apron-front sinks and rustic wood countertops. White has long been a popular neutral color for kitchens, and black and white has been made popular by minimalist kitchen designs. Recently, though, grey has become increasingly more popular in new kitchens. Grey is a neutral color, but softer and not as stark as black and white. With the trend toward neutral color schemes in kitchens, it has also become popular to include an eye-catching pop of color. One popular way to do so is with a colorful apron-front sink. These sinks are big enough for the bright color to make a splash, as well as stylish in their own right. Another way to infuse color into your kitchen is by painting your kitchen island a different color than the rest of your cabinetry. This will help your beautiful island stand out from the rest of the kitchen, becoming a focal point in the space. This kitchen island features a different paint color and a custom butcher block countertop. Granite is still the most popular type of countertop in high end kitchens, but wood is becoming increasingly more popular. Wood countertops offer traditional styling and classic finishes, and they can also be combined with other materials for a dramatic look. For instance, an island with a sink and preparation space on one side and a breakfast bar on the other can be half-granite, half-wood. There are many modern trends in appliances that will make your kitchen impress in terms of functionality and convenience, as well as aesthetics. For instance, refrigerators with the freezer on bottom; wall ovens; duplicate appliances such as dishwashers and ovens; and wine refrigerators are all making strong inroads into modern kitchen design. Smart appliances are also popular: For instance, your oven could send you a text instead of just ringing a buzzer when your dinner is done cooking. As kitchens become more ultra-modern, maximizing storage space is becoming important. Look for trends that reflect this priority in 2016 kitchen design, such as tiered drawers that make use of wasted space at the top of the drawer, as well as pullouts, rollouts, and Lazy Susans to make the storage space at the back more accessible. Never have you been more likely to get your dream kitchen than in 2016. Regardless of your personal preferences and tastes, current trends offer plenty of opportunities to personalize your kitchen space. With all of these exciting new trends, modern kitchen design is closer to perfect than ever. What changed would make your kitchen more beautiful and functional? Click here to request an estimate.